Ipsilateral, concomitant femoral neck and shaft fracture is a rare fracture pattern that presents a diagnostic and treatment challenge. Five cases treated with the Russell-Taylor reconstructive nail between 1999 and 2005 at the Health Insurance Hospital and the Al-Azhar University Hospital were included. The average follow-up period was 26 months (range, 18-32 months). The mean time for the union of femoral neck fractures was 4.3 months and for femoral shaft fractures 5.4 months. No avascular necrosis of the femoral head or nonunion of either fracture site occurred. There was no case of hardware failure. There was varus healing of one femoral neck fracture and one case had malalignment of the femoral shaft fracture. Although ipsilateral femoral neck and shaft fractures are technically demanding, the Russell-Taylor nail has proven to be a successful treatment method in these dual fractures, resulting in a good functional outcome and a low complication rate. Ipsilateral femoral neck and shaft fractures have been a challenging problem for orthopedic surgeons since first described by Delaney and Street in 1953 . The incidence of this fracture pattern ranges from 2.5 to 6% of all femur fractures . Most commonly, these fractures occur in young adult multiple-traumatized patients, often caused by high-energy trauma. The femoral neck component of this injury is commonly missed initially; most frequently, it is a nondisplaced or a minimally displaced vertical fracture. The shaft fracture is often in the midshaft (52-95%), open, comminuted, or both [3-5]. More than 60 suggested options for treatment have been described in the literature; no method has been proven to be exclusively more effective than the others . Recently, second-generation intramedullary locking nails have been used in the treatment of this complicated fracture pattern, providing fixation of both fractures with a single implant [6-10]. The aim of this study was to evaluate the results of treatment of five cases with ipsilateral femoral neck and shaft fractures, using the Russell-Taylor reconstructive nail. This study included five patients with ipsilateral concomitant fractures of the femoral neck and shaft, who underwent operative fixation using the Russell-Taylor reconstructive locked nail at the Health Insurance and the Al-Azhar University Hospitals between 1999 and 2005. High-velocity motor vehicle accidents accounted for three injuries, whereas two injuries were caused by fall from a height. There were four male and one female patient. The average age of patients at the time of injury was 33 years (range, 19-45 years). The right side was involved in three cases and the left in two cases. The shaft fracture was located at the middle third in four cases, and at the distal third in one case. The comminution and displacement of the shaft fractures were categorized according to the criteria of the Winquist and Hansen classification system : there were two type II and three type III fractures. Neck fractures were classified using Garden's method ; there were three grade II and two grade III fractures. Using Pauwels classification  for neck fractures, there were one class 2 and four class 3 fractures, which shows neck fractures' predilection toward vertical orientation . There were two open shaft fractures of grade II in accordance with the Gustilo system . Patients suffered additional injuries and fractures ([Table 1]). Operative fixation was undertaken within the first 24 h in one patient, within 1 week in two patients, and after 2 weeks in two patients. Delay was due to late transfer or care of associated injuries. All patients had fixation of both fractures with the Russell-Taylor reconstructive nail using the closed antegrade technique. Open injuries were irrigated and debrided before nailing. Using a traction radiolucent table, closed reduction of fractures was achieved under image-intensifier control and maintained using traction. Provisional fixation of neck fracture was performed using two Kirschner wires to prevent displacement during nail insertion, and care was taken when opening the femoral canal to reduce the risk of augmenting the extension of the femoral neck fracture. The shaft was over-reamed by 1.5-2 mm due to the rigid construct and the enlarged proximal portion of the nail. Before introducing the nail, the neck anteversion was checked using the C-arm. Proximal locking was achieved by two partially threaded screws inserted obliquely into the femoral neck and head, and distal locking by two fully threaded screws . Postoperatively, patients were maintained at a partial weight-bearing status on the affected extremity until radiographic evidence of bony union was observed; this averaged 12 weeks (range, 10-16 weeks). Then, full weight-bearing was encouraged; this was affected by the progress in healing of other associated musculoskeletal injuries. The follow-up averaged 26 months (range, 18-32 months). Clinical follow-up records and roentgenographs were reviewed for the evaluation of the functional outcome, healing, development of avascular necrosis of the femoral head, and malunion or nonunion at either fracture site. The patients' functional results were evaluated as follows: good, no limitation of activities of daily living (ADL), no pain, and less than 20% loss of hip or knee motion; fair, mild limitation of ADL, mild to moderate pain, and 20-50% loss of motion; and poor, moderate limitation of ADL, severe pain, and more than 50% loss of motion . The functional outcome for patients was rated as good; no fair or poor results were reported. All neck and shaft fractures united. Neck fracture union averaged 4.3 months (range, 3-6 months). Shaft fracture union averaged 5.4 months (range, 4-7 months). No patient had avascular necrosis of the femoral head. There was no femoral shortening. Delayed union was recorded in one femoral shaft fracture. One patient had superficial wound infection (grade II open shaft fracture) that was controlled by local care and proper antibiotics. No cases of deep venous thrombosis or fat embolism were recorded. No hardware failure of any component of the nail was noted. Technical errors resulted in varus hip in one case due to the lateral portal of the nail. In another case, the femoral shaft fracture was not aligned properly during nail insertion, which led to reduction in valgus and cutting out of the nail tip through the medial cortex of the femur ([Figure 1] and [Figure 2]). Figure 1 (a) Preoperative. (b) Postoperative (above the knee cast for ipsilateral tibial fracture) anteroposterior and lateral views. (c) At follow-up. Figure 2 (a) Preoperative. (b, c) Postoperative (dynamic condylar screw (DCS) for contralateral trochanteric fracture). (d) At follow-up. Ipsilateral femoral neck and shaft fractures pose a diagnostic and treatment challenge. The diagnosis of ipsilateral femoral neck fracture is often missed initially. Swiontkowski et al. found a delayed diagnosis rate of 19% and Bennet et al. found a rate of 31%. The femoral neck component of this injury pattern is missed for several reasons: there is diversion by the treatment of life-threatening injuries; focus is on the more obvious femoral shaft fracture; patients who have a head injury cannot report hip pain; and many fractures are nondisplaced or minimally displaced . When neck fracture is missed at the initial evaluation, treatment options later become significantly more limited and more difficult, especially if an intramedully nail has been used to fix the shaft fracture . Meticulous radiographic examination is recommended in any case of high-energy femoral shaft fractures. The trauma anteroposterior pelvis radiograph usually images the femoral neck in the external rotation, which does not profile the femoral neck well; 15° of internal rotation is therefore recommended . Stabilization of this complex fracture is a controversial issue. Several techniques have been described; no ideal method of fracture fixation is found in the literature [2,17]. Alho  reported that second-generation nails (reconstruction nails) yielded outcomes comparable to those of first-generation locked nails with separate hip screws; these two kinds of fixations assured better results than other traditional fixation methods. Wiss et al. reported that closed reamed antegrade intramedullary nailing with supplemental screw fixation of the femoral neck and shaft fractures did not produce uniform successful results because of a high rate (18%) of symptomatic varus nonunion of the femoral neck fracture. When used to fix both fractures, the Y-nail, Ender's pins, and the Ziekel nail do not provide compression of the neck fracture; moreover, all have a tendency to distract the femoral neck fracture . Bucholz and Rathjen  used a reversed interlocking nail: supplemental cancellous screws were required as the locking screw is fully threaded and will not apply compression to the neck fracture. Wolinsky and colleagues [2,4] found difficulty in inserting the cancellous screws anterior to the traditional locked nail. Good results have been reported using second-generation reconstruction nails [7, 8, 15]. The major advantages are that one device can be used to stabilize both fractures and compression of neck fracture can be achieved with the use of the partially threaded proximal locking screws, reducing the incidence of nonunion. The length and rotation of the femoral shaft fracture can also be managed by static interlocking. Biomechanical studies of cadaveric femurs demonstrate that the ultimate strength of the reconstruction nail fixation of the neck fracture is higher than that afforded by cancellous screw fixation alone . Compression across the neck fracture site decreases the possibility of further displacement, and there is less probability of varus neck deformity . The disadvantage of the index procedure is that it is a technically demanding operation, with technical difficulty of accurate placement of the proximal screws in the head and neck. The femoral shaft canal should be over-reamed 1.5-2 mm larger than the nail to allow for adjustment of the anteversion angle. Because the neck originates anteriorly on the proximal femur, the nail must often be externally rotated 30°-40° to obtain a fully centered screw placement in the femoral head. If the nail is not driven at a proper distance, only one screw can be inserted into the head and neck . A potential complication that must be avoided is displacement of the femoral neck fracture during nail insertion ; many surgeons place temporary Kirschner wires in the femoral neck [7,15]. The use of provisional Kirschner-wire fixation of the neck fracture proved effective in our series. Gibbons et al. encountered several technical problems due to the straightness of the nail relative to the curved femoral canal. The Russell-Taylor reconstruction nail has a greater radius of curvature than other devices, and is therefore liable to cut-out distally, particularly in soft pathological bones, if the entry point is too posterior. In the current study also, the lateral portal led to a varus hip in one case. The distal tip of the nail violated the medial cortex of the distal femur; the distal femur was not aligned properly during insertion, and eventually, there was 15° valgus. Bose et al. treated five patients with the Russell-Taylor reconstruction nail and had technical difficulties in inserting two of them, with one leading to malunion. Randelli et al. used the Russell-Taylor reconstruction nail in a series of 27 ipsilateral femoral neck and shaft fractures. There were no cases of nonunion or implant failure. Complications included avascular necrosis of the femoral head, varus healing of the neck, and rotational malalignment of the femoral shaft, in one each. Hossam et al. used the Russell-Taylor reconstruction nail in the treatment of nine patients with ipsilateral fractures of the femoral neck and shaft. There were no cases of nonunion or avascular necrosis. The average time to union was 4.2 months for the neck fracture and 6.9 months for the shaft fracture. One hip healed in mil varus, one shaft had delayed union, and one patient developed a late infection of the femoral shaft. Jain et al. reported a series of 23 cases of ipsilateral hip and femoral shaft fractures. All except two cases were treated by a reconstruction nail. There was one case of nonunion of the neck fracture, one case of avascular necrosis of the femoral head, and one femoral shaft fracture united in varus. There were four cases of nonunion and six cases of delayed union of the femoral shaft fracture. The mean time for union of the femoral neck fracture was 15 weeks and for the shaft fracture was 22 weeks. We treated five patients with ipsilateral femoral neck and shaft fractures, all diagnosed preoperatively, with the Russell-Taylor reconstructive nail. Neck fractures healed within an average of 4.3 months (range, 3-6 months), whereas shaft fractures healed within an average of 5.4 months (range, 4-7 months). All fractures healed and all patients had a good functional outcome. One hip healed in mild varus; it was due to a technical error with the nail inserted too laterally. There were no cases of femoral neck nonunion or femoral head avascular necrosis. There was no implant failure. Our results compare well with findings in other recent studies on using the Russell-Taylor reconstruction nail for the treatment of ipsilateral femoral neck and shaft fractures. After reviewing the world literature, Casey and Chapman  reported a rate of 4% avascular necrosis of the femoral head after these fractures. Swiontkowski et al. reported a 22% rate in a study of nine patients who had follow-up for more than 3 years, and suggested that this low rate may be secondary to energy dissipation at the shaft fracture, which makes the neck fracture a low-energy injury pattern, nondisplaced or minimally displaced, with less interruption of the blood supply. At a mean follow-up of 26 months, no case of avascular necrosis was reported in our study; signs and symptoms of osteonecrosis, however, develop in young adult patients, in particular more than 3 years after injury . The authors agree with Wolinsky and colleagues [2, 4, 20] that fixation of the femoral neck should take precedence over fixation of the femoral shaft. This decreases the risk of further disrupting the blood supply to the femoral head, leading to a decrease in the incidence of avascular necrosis. The high incidence of associated knee injuries in our study coincides with other reported series [3,16] and supports the fact that the mechanism of injury is that of a longitudinal compressive force applied to a flexed, abducted femur with the knee flexed [24,25]. Adequate knee examination is important as is the evaluation of the knee stability after femoral fixation; knee injury is frequently overlooked, resulting in residual disability and less than optimal results. Antegrade nailing is preferred, as opposed to retrograde nailing, which may risk further damage to an already traumatized knee . Our results confirmed findings of other studies that although technically demanding, the reconstruction nail is an acceptable alternative for the management of concomitant ipsilateral fractures of the femoral neck and shaft, with a good functional outcome and few complications. Delaney WM, Street DM. Fracture of femoral shaft with fracture of neck of same femur; treatment with medullary nail for shaft and Knowles pins for neck. J Int Coll Surg 1953; 19:303-312. Wolinsky PR, Johnson KD. Ipsilateral femoral neck and shaft fractures. Clin Orthop 1995; 318:81-90. Casey MJ, Chapman MW. Ipsilateral concomitant fractures of the hip and femoral shaft. J Bone Joint Surg Am 1979; 61:503-509. Swiontkowski MF, Hansen ST Jr, Kellam J. Ipsilateral fractures of the femoral neck and shaft. A treatment protocol. J Bone Joint Surg Am 1984; 66:260-268. Swiontkowski MF. Ipsilateral femoral shaft and hip fractures. Orthop Clin North Am 1987; 18:73-84. Bose WJ, Corces A, Anderson LD. A preliminary experience with the Russell-Taylor reconstruction nail for complex femoral fractures. J Trauma 1992; 32:71-76. Bennet FS, Zinar DM, Kilgus DJ. Ipsilateral hip and femoral shaft fractures. Clin Orthop 1993; 296:168-177. Koldenhoven GA, Burke JS, Pierron R. Ipsilateral femoral neck and shaft fractures. South Med J 1997; 90:288-293. Jain P, Maini L, Mishra P, Upadhyay A, Agarwal A. Cephalomedullary interlocked nail for ipsilateral hip and femoral shaft fractures. Injury 2004; 35:1031-1038. Kakkar R, Kumar S, Singh AK. Cephalomedullary nailing for proximal femoral fractures. Int Orthop 2005; 29:21-24. Winquist RA, Hansen ST Jr. Comminuted fractures of the femoral shaft treated by intramedullary nailing. Orthop Clin North Am 1980; 11: 633-648. Garden RS. Low-angle fixation in fractures of the femoral neck. J Bone Joint Surg Br 1961; 43:647-651. Pauwels FFuroling RJ, P Maquet eds. Biomechanics of the normal and diseased hip. Berlin: Springer-Verlag; 1976. Gustilo RB, Anderson JT. Prevention of infection in the treatment of one thousand and twenty-five open fractures of long bones: retrospective and prospective analyses. J Bone Joint Surg Am 1976; 58:453-458. Randelli P, Landi S, Fanton F, Hoover GK, Morandi M. Treatment of ipsilateral femoral neck and shaft fractures with the Russell-Taylor reconstructive nail. Orthopedics 1999; 22:673-676. Friedman RJ, Wyman Et. Ipsilateral hip and femoral shaft fractures. Clin Orthop 1986; 208:188-194. Plancher KD, Donshik JD. Femoral neck and ipsilateral neck and shaft fractures in the young adult. Orthop Clin North Am 1997; 28:447-459. Alho A. Concurrent ipsilateral fractures of the hip and femoral shaft: a meta-analysis of 659 cases. Acta Orthop Scand 1996; 67:19-28. Wiss DA, Sima W, Brien WW. Ipsilateral fractures of the femoral neck and shaft. J Orthop Trauma 1992; 6:159-166. 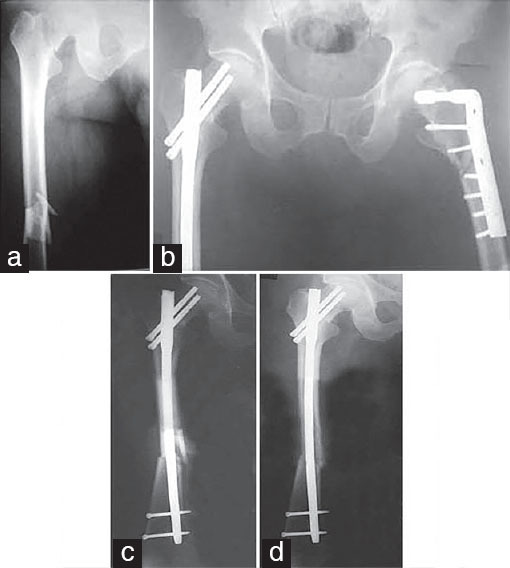 Bucholz RW, Rathjen K. Concomitant ipsilateral fractures of the hip and femur treated with interlocking nails. Orthopedics 1985; 8:1402-1406. Ramser J, Mihalko W, Carr J, et al. A comparison of femoral neck fixation with the reconstruction nail versus cancellous screws in anatomical specimens. Clin Orthop 1993; 190:189-196. Gibbons CL, Gregg-Smith SJ, Carrell TW, Murray DW, Simpson AH. 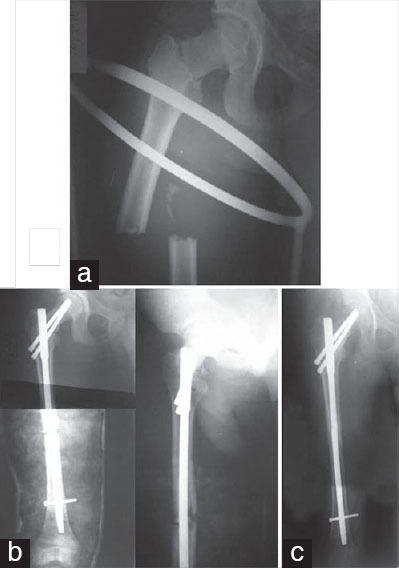 Use of the Russell-Taylor reconstruction nail in femoral shaft fractures. Injury 1995; 26:389-392. Hossam ElShafie M, Adel Morsey H, Emad Eid Y. Ipsilateral fracture of the femoral neck and shaft, treatment by reconstruction interlocking nail. Arch Orthop Trauma Surg 2001; 121:71-74. Ritchey SJ, Schonholtz GJ, Thompson MS. The dashboard femoral fracture; pathomechanics, treatment, and prevention. J Bone Joint Surg Am 1958; 40-A:1347-1358. Russell TA. Management of ipsilateral hip and shaft fractures. Curr Tech Orthop 1991; 1:292.